Hero Gopichand has been picking up consecutively mass movies since the beginning days of his career and they’ve finally brought a brand for his movies. As the actor bagged a super hit with his previous film “Loukyam”, now he is geared up for his next release “Jill”. 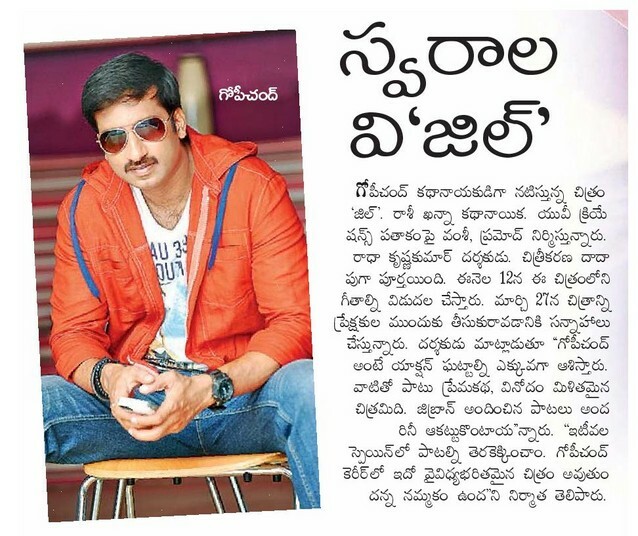 As this is Gopichand’s first release in this very year, he has pinned all his hopes on it. Now according to the latest updates about the film, the makers have almost wrapped up the shooting of this film and it’s already entered the post-production phase. The movie has reportedly got its release date preponed as it will be hitting the screens on March 27th instead of previously announced April. Reportedly, the makers have planned to release the audio on 12th March and the movie will hit the screens on 27th after a grand promotion. Directed by Radha Krishna, the movie is jointly being produced by Vamsi Krishna Reddy and Pramod Uppalapati under the banner UV creations.